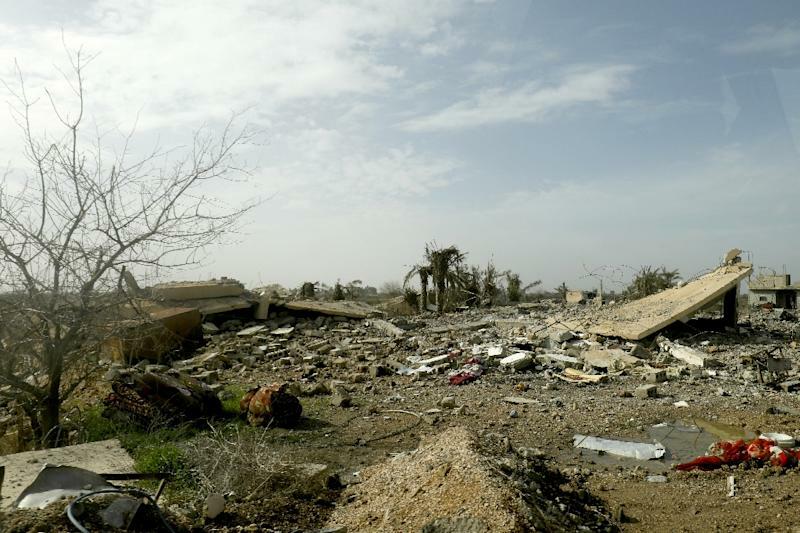 Baghouz (Syria) (AFP) - The wilted palms and pomegranate trees at the entrance to Baghouz were struggling to survive, much like diehard Islamic State group fighters in the Syrian village. Pinned down in a patch less than half a square kilometre, the jihadists faced intermittent air strikes by the US-led coalition backing the Syrian Democratic Forces. On a press tour Saturday organised by the US-backed forces, the street ahead was punched through by massive craters and sprinkled with charred lorries. "The SDF were here," read a spray-painted Arabic message on a one-storey house. Atop a building captured by the SDF, a fighter peered out at columns of smoke from fresh bombardment. "They fire at us at night, then clashes start before they run away again," said Hamza Shaddadi, his rifle slung over his shoulder and a walkie-talkie in his hand. "But we don't get any closer because of the civilians," he told AFP. SDF officials say they have IS surrounded in a tiny part of Baghouz but are holding off on an assault because civilians -- including families of IS fighters -- are still thought to be inside. But the town would be cleared "in just a few days", said Shaddadi, who seemed visibly impatient. Even in areas already captured from the jihadists, SDF units combed through rubble and ruined houses used as IS bases in search of secret tunnels, sleeper cells, or unexploded ordnance. 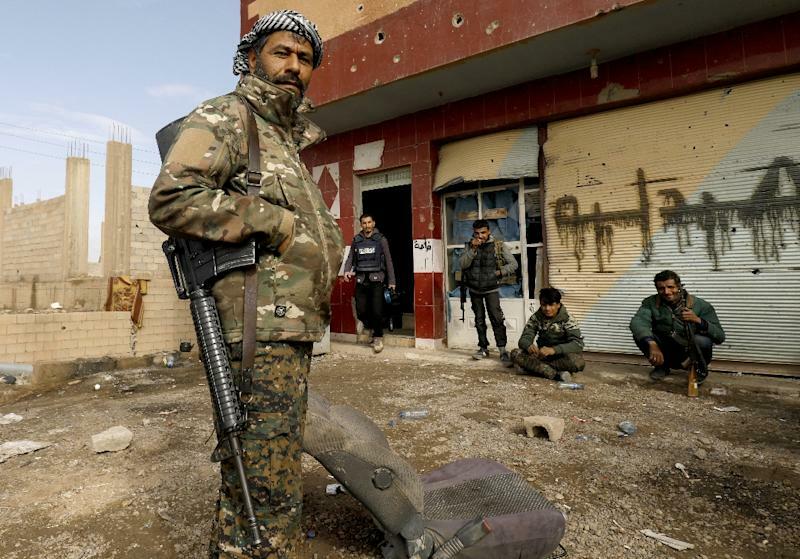 SDF fighters, their heads covered in traditional flowered Kurdish scarves, barely flinched at the sound of gunfire further ahead, which was quickly followed by the roar of airplanes and two booming air strikes. There were no civilians in the homes or in the muddy streets at the entrance to Baghouz, only armoured cars zipping sharply around corners in the crushed town. It was not the first time the SDF had battled for these neighbourhoods. After launching their latest offensive against IS in September, their units took Baghouz easily, but IS recaptured it a few weeks later during a storm and dug in. Diaa Hasakeh was back for the second round, but told AFP the town was now in much worse shape. "When we took it a few months ago, we'd climb up on the rooftops and pick dates and pomegranates," said Diaa Hasakeh, a bespectacled fighter who fought in the first round and is back for the final battle. He pointed to the shrivelled pomegranate trees whose red fruit had rotted on the branch, near yellowed palm trees some of which had nothing left but their trunks. "Today, their area of control has shrunk so they're being more ferocious in their fighting," said of the jihadists. "In the past, they wouldn't resist a lot as they had other places to withdraw to." SDF commanders say their fighters have faced explosives-laden motorcycles, suicide bombers, and ambushes from behind the front line in recent days. 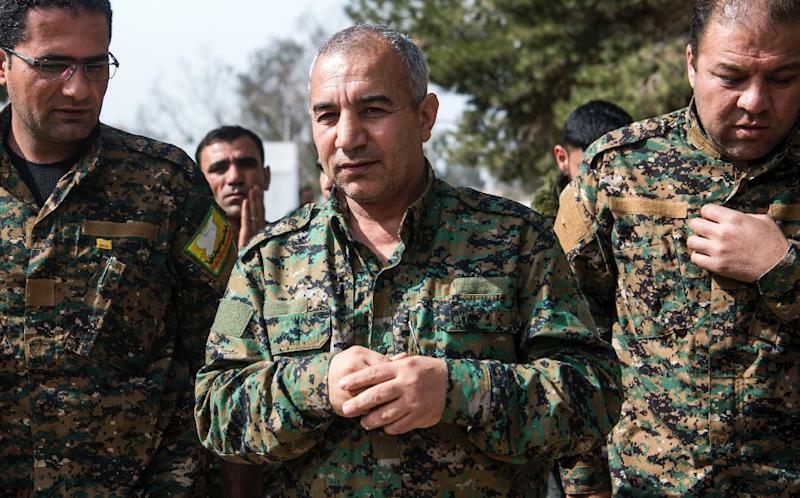 On Saturday, top SDF commander Jia Furat said victory was nigh. "In a very short time, not longer than a few days, we will officially announce the end of IS's existence," he said. The jihadists once controlled a territory that sprawled across Syria and Iraq that was home to millions. But the "caliphate" their elusive chief Abu Bakr al-Baghdadi declared more than four years ago in Iraq's Mosul is about to collapse on the shores of the Euphrates River. Baghouz, unlike surrounding towns, has two-storey stone villas built by locals who emigrated to work in the oil-rich Arab Gulf states, an SDF fighter said. "Any area with a river running through it is beautiful, but anywhere that Daesh goes is ruined," said Hasakeh, using the Arabic acronym for IS.